The Force was not with Solo: A Star Wars Story after all, not as much as Disney and Lucasfilm were expecting. Directed by Ron Howard and starring Alden Ehrenreich, the film follows Han Solo – an iconic character made famous by Harrison Ford – as he meets Chewbacca and other misfits in his younger days as a mercenary pilot. Also starring Woody Harrelson, Emilia Clarke, Donald Glover and Paul Bettany, Solo’s original opening forecast was on the range of $300 million. It barely made half of that amount, with a $103 million domestic gross for the 4-day Memorial Day weekend. Overseas, things went pretty badly and a high profile promotional push at the Cannes Film Festival did not produce the expected results, with a first weekend debut of just $68 million out of 54 markets. More and more often, the salvation for underperforming films comes from China. But the backstory of Han Solo did not arouse much interest in the Middle Kingdom. Audiences forked just $10 million and turned out in much bigger number for Avengers: Infinity War in its third week in theaters. Solo added $10 million out of the UK and other decent markets were Australia, Germany, France and Mexico. 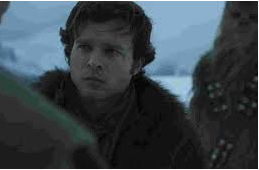 When you add up its production and marketing costs Solo had a budget of approximately $400 million, an amount very hard to recover. And now, with Lucasfilm having nine more Star Wars in the pipeline the question is: Why? What went wrong? The most obvious explanation is Star Wars fatigue. Star Wars movies have been spaced years apart, always at least a year. But Solo has hit theaters just five months after the release of The Last Jedi and now as Disney and Lucasfilm review their strategy they are going to have to ask themselves if there is indeed room for stand-alone movies focused on Obi-Wan Kenobi and Boba Fett. The last three Star Wars movies have generated $4 billion. This is not a crisis, but another issue to be reviewed will be the decision to hit theaters not at Christmastime but in the summer blockbuster season. Solo was released only one week after Deadpool 2, that in its second week managed to pull off $55 million out of the domestic market and $57 million from overseas, meaning the irreverent superhero played by Ryan Reynolds has already crossed the $500 million mark. And is still going strong, beating Solo in 27 markets. In South Korea it was 4 to 1, or $4.4 million versus $1.1 million. Deadpool also keeps doing excellent business in the UK, in Australia and France. Then there was the internal competition: Marvel and Disney’s Avengers: Infinity War, three films chasing the wallets of very similar audiences. Avengers domestic four-day gross was $21.2 million, for a domestic total of over $626 million. Internationally, Infinity War added $32.5 million, which means it has passed the $1.9 billion mark. China alone has generated $337 million, but Avengers was beaten by the local production How Long Will I Love U, which generated $81 million. No. 4 in the domestic market and targeting a very different kind of audience was Paramount’s Book Club, starring Diane Keaton, Jane Fonda, Mary Steenburgen and Candice Bergen. It grossed $12.5 million in its second week and at the end of Memorial Day weekend Book Club was at $34.7 million. Another entry worthy of note is RBG, Magnolia and Participant’s documentary on Supreme Court Justice Ruth Bader Ginsburg: it added $1.6 million and its domestic total is now $6 million. Solo may recover but it will face soon new competition. Universal’s gigantic beasts of Jurassic World: The Fallen Kingdom will start roaming overseas theaters on Junes 6 and will hit US shores on June 22. Disney will have strong weapons to reply with: Pixar’s Incredibles 2 and Marvel’s Ant-Man and the Wasp.